My good writer friend and fellow Scribe, Kathy Palm, sold a new story and it’s available on Kindle for $2.99. I’ll let her tell you about it. Back in 2006 or 2007, or somewhere in there, I had an idea for a girl who could hear the thoughts of others. Her name was Lucinda…Cinda for short. So i wrote it. 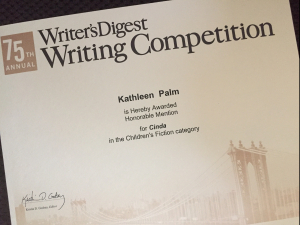 And it received an honorable mention from the Writer’s Digest short story competition. I was very excited. I was so excited, I decided to submit it. Remember Leading Edge magazine from my last post? They published my story “Marked” (the story that didn’t place in the same competition), so I sent “Cinda” to them. It was rejected. Now, the wonderful thing about Leading Edge is that they send feedback from readers. I had comments on why the story didn’t work, which helped me rethink the idea, and I rewrote it. It was rejected again with more comments. Though none of what anyone said clicked in my brain, so I set the story aside.